After I heard the 120 and 200 for the first time and wrote the first part of this review, things went fast. The owner of the 120 sold his unit in order to purchase a 200. Not for sound reasons, but because it has a subwoofer output and pre-outs built in as standard. He had plans to connect big tube power amps. Had indeed, more on this later. By this time I was so intrigued by this remarkable product that I decided to buy the 120 from him. We immediately agreed that once he had obtained a 200 that we would carry out a direct side-by-side comparison. When the comparison took place, we formed a nice Devialet-owners group of 3, and long time listening buddy JW was also present. Collected in the room as such were some of the most critical ears I know, so if there were differences to pick up, we sure would hear them! The 120 and 200 need some warm up time. This is known, but I haven’t seen it mentioned anywhere how they both tend to subtly increase perceived volume (the setting remains the same) over the course of the first few tracks played after being switched off and on. The midrange becomes more crispy and the whole more dynamic. We repeatedly found that the volume could be lowered by 1-2dB after about 10 minutes, in order to sound as loud as the previous amp. None of us had picked up on this before. It could be that this only now became obvious, now that we were listening so closely. One Devialet seriously influences the sound of the other, when switched on and connected to the same power outlet. This one really shocked us. After we started listening to the 120 with the 200 also connected to the power in order for both to remain warmed up, I noticed during the first few tracks how the sound was too closed in between the speakers, and lacking dynamic expression. This wasn’t how I remembered my sound. My first suspicion was that the 200 had to have something to do with this as this was the only change in the system. Immediately after I removed it, the sound became clearer, faster, more dynamic and more involving. Soundstage also grew in size considerably. Now, after I moved the 200 to the other side of the room and connected it to an outlet that is on a different mains group, its influence could no longer be heard. Now, it is definitely possible that the effect heard in point 2 excacerbated the effect of point 3, but we did this test twice, using both amps and reversed, and both times the sound improved immediately after removing the spare amp. What’s more, the second time we tested this was after having listened to the 200 for more than an hour (well after the volume level was settled), then moving the 120 from the outlet at the other side of the room to the same extensionblock as the 120, and once again the sound collapsed rightaway. This is something to keep in mind for people deciding between the two models, as well as for people who connect two units for bridged operation. 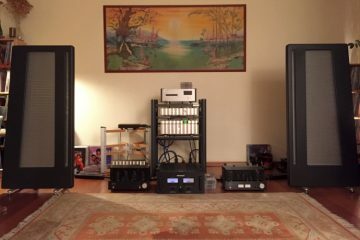 After first having listened to the 200 one night, then the 120 the next night and I couldn’t hear obvious differences, we decided to join forces to put an 120 and a 200 head to head in a direct comparison. Naturally I paid attention to power phase and used the same powercable in the same extensionblock output and placed the amp in the same position on the same level of the same audiorack. There’s a lot of same’s there, but I just want to point out that all circumstances were, well, the same for each amplifier. A standard power cable was used because so far this provides the best balance in my setup. I tried Harmonic Technology and Lapp, but both muddled the sound and restrained the amps’ dynamic behaviour. Speaker cables used were cheap and cheerful van den Hul Skyline Hybrid for no better reason than that this is what the previous owner used for the Apogee Duetta’s crossovers and internal wiring. As a side note these speakers’ crossovers were modified by the previous owner, providing a balance that was too bright for me. 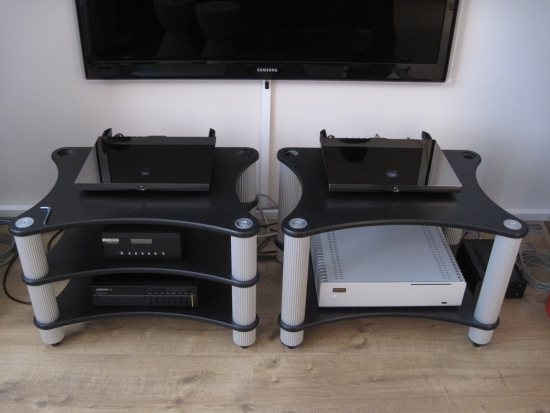 Recently I was gifted two original crossovers by Henk van der Hoeven, Dutch restorer for Apogee, and in order to make for a fair comparison I used the same speaker cable for these crossovers. The funny thing is that this cable seems to work extremely well, yet only costs about 6 euro per meter for a single run! I use a double run in a bi-wire configuration, which makes a large difference from a single run in terms of soundstage width and height, as well as dynamic differentiation. Anyway, these cables surely can be improved upon, but for now I am used to this cable and for this review it has worked very well. I have carried out extensive comparisons using the various digital connection methods and found that a music server over USB sounds best to me. I will explain the differences between USB, Air over Wifi and Air over Ethernet further below, but for now please note that the source used is an AudioAanZee Reference Flow music server via an Audioquest Diamond USB cable. The listening panel consisted of myself, owner of a 120, friends Jan and Berry each owning a 200 and my long time listening buddy JW. While the setup in listening room 2 is not ideal. 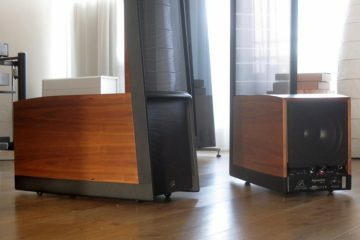 The room is 7 meters deep and the listening sofa’s rear end is positioned precisely halfway the room at 3,5 meters which means that for the center position the head and ears are 2,7 meters from the speakers which are themselves very close to the rear wall. Still, the sound is very good, if very precise due to the total absence of room interactions. 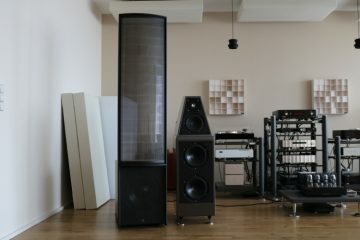 The room treatments (originally installed for the computer audio setup using Genelec 8050 near field speakers) add to this but are also a large factor in the sound still being so good in what is practically still a near-field situation. 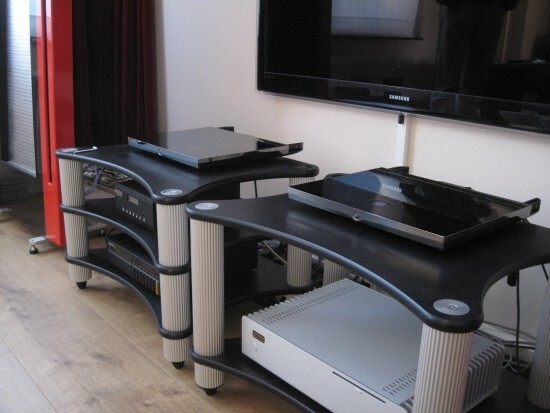 Sitting so close to the speakers will however easily reveal such things as bright treble or overly tight bass. The listening couch comfortably provides room for only 3 people so I added a chair behind the sofa for the 4th panel member. Do note for now that this position provides a fuller, more relaxed and less forward sound, but I will get to this further below. At the time of writing this second part of the review I have owned a 120 for almost 2 weeks and am now intimately familiar with its sound. Please read the “3 observations” section above if you have skipped it because it contains important info on how the amps interact with each other. For the purpose of the comparison I had made a long playlist with all sorts of music catering to each of the panel members’ musical taste. In order to get all ears aligned I played a part of each track and after about 30 minutes it was time to swap to the 200. First thing I noticed after the switch, is that the 200 does indeed sound more powerful than the 120, and quite a bit more controlled. For Jan in the rear position this was nice, as it provided more bass oompf and lended more body and substance to vocals. To him, the 200 sounded fuller, and not at all overly controlled, but to JW, Berry and myself in the front position, the extra control excerted by the 200 was a bit of a double-edged sword: on the one hand making vocals and percussive instruments (piano, too), sound tonally more full-bodied and more acoustically convincing, on the other hand making already square R&B beats sound overly tight and piercing. 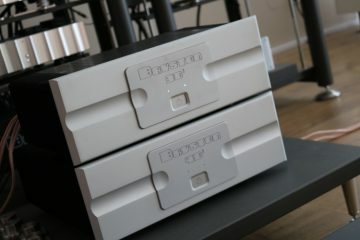 Now, I realise that modern R&B production values shouldn’t be the deciding factor for amplifier choice, but it quickly became evident that the 200’s extra power and control was present in all music played and JW and I soon grew listening fatigue and I had the urge to turn the volume down on quite a few tracks. Then again, the more relaxed recordings, such as soothing Brazilian songs, easy jazz and other easy going music definitely sounded better with the 200. More powerful and expressive, and more believable, too. Finally, not a huge difference, but the soundstage was a little wider. Going back to the 120 was a feast of recognition on the one hand and a bit of a let down on the other. For sure the 120’s treble was more airy and definitely more subtle and fluid, and its bass, although definitely less powerful, was still nicely full and because it was less extremely damped, I found it easier to relax into the music. Mind you the 120’s bass is still way better controlled than any other amplifier I tried recently, my class AB Rowlands included, so things certainly are relative here. The midrange however took some getting used to. After the 200 had sounded so utterly acoustically believable, the 120 sounded somewhat thin or undernourished. If the 200 sounded somewhat forward in the lower midrange, the 120 sounded somewhat restrained in that section. Another way of looking at this is to say that the 200 sounds a bit more analytical, and the 120 sounds a bit more romantic. While the 4 of us heard the same thing, we had different preferences. Ultimately though we all agreed that we could all probably live with either amp, as long as it was properly bedded in, meaning fuller, warmer cables and a listening position further away from the speakers for the 200 and more open sounding cables for the 120. 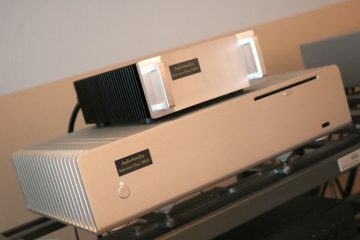 It should also be noted that the Apogee Duettas sound very articulate and sound very powerful by nature. 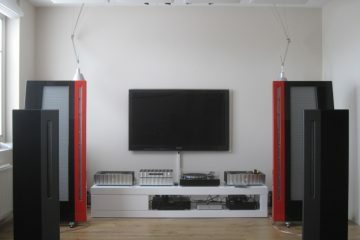 Other speakers such as Berry’s Magnepan 1.7i’s, or my own Divas, can certainly put the 200’s extra power to good use. And when seated much further away, such as in my main listening room, as I recall from the first comparisons, the 200’s extra control was not an issue at all. I should carry out a direct comparison in the main setup as well as I suspect that I might actually prefer the 200 in that room. Another thing we noticed was that the soundstage was slightly wider on the 200 but that it also portrayed vocals wider less focused manner, spanning the entire cavity between the speakers, whereas the 120 seemed to focus vocals more into a smaller ball right in the middle. Whether one is preferred over the other is more a matter of personal taste, and less a sign of amplifier quality as far as I am concerned. Unlike reports I read on the internet, and even in spite of friends having the infamous “white noise” problem, I have yet to encounter this. I did experience a stuttering using WiFi only once on one track and never again after that, but then my WiFi access point is only a few meters away from the Devialet. I must say that the unit already sounds impressive using the Air software on a Windows PC over WiFi. So good it sounded in fact that I did not feel the need to try other connection methods. However after installing the Solid Tech racks the sound became more analytical and this prompted some experiments with spikes and Ceraballs, as well as experiments with Ethernet and USB. Ethernet and WiFi can be enabled simultaneously. Either mode just needs to be enabled from the Air software, then the appropriate input selected using the Devialet’s source button. In spite of the theoretical bit-perfect nature of the Air protocol, there are differences in sound between Air over WiFi and Air over ethernet. The latter sounds more grounded, with a fuller, more powerful bass, more pronounced, timbrally fuller lower mids and treble that’s just as airy as over WiFi but cleaner and more fluid. These differences can be easily heard, but they’re smaller than the differences between the 120 and 200, and depending on the speakers used, and the level of paranoia of the user, either Air method can work well enough. In other words if you won’t use USB and definitely don’t want to use ethernet cables, and can put up with the occasional hickup, then using WiFi is just fine. USB however turned out to be something else than either of the two Air methods. Air over ethernet already sounds more full-bodied than Air over WiFi, but USB multiplies the above mentioned differences… with the AudioAanZee Reference Flow music server at least. If a Mac Mini or a laptop were used then I’d say that the differences could well be much smaller, and the choice may even fall for Ethernet. 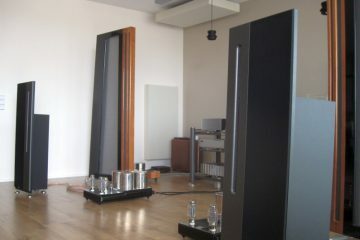 With a music server as musical as the Reference Flow however the change in musicality is simply too large to ignore: much fuller and more voluptuous bass, richer, more emotionally engaging midrange and a much smoother, more fluid and entirely stress-free treble. This was kind of a bummer for me I must say as I had high hopes of being able to continue to use Air, which means that I could use a variety of playback applications on the PC. The server however sounds so engaging that I just can’t bring myself to go back. To put this into context: I prefer a full, relaxed, smooth sound, and this is where the Reference Flow excells. 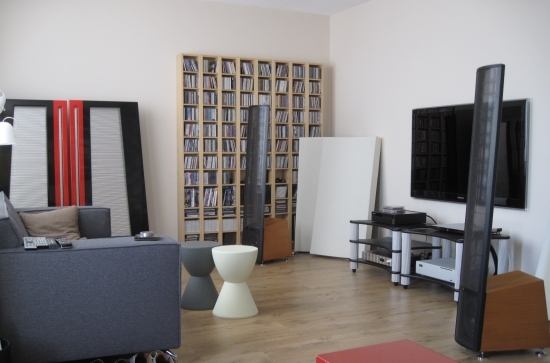 If you prefer / can put up with a leaner, less colourful sound, then Air might also be fine for you. The Reference Flow doesn’t dig out unheard details, but provides what I feel is the more emotionally engaging performance. Although so far I had been impressed with the Devialet in spite of using standard power cables, the cooling temperatures outside (winter is coming) have their effect on the overall sound of my system, and now and then I find the sound a little too accurate, not subtle enough. The lyrical effect lessened on some tracks. This was my cue to try a variety of power cords. First alternative tried was Harmonic Technology Pro ACII. These cables work very well on most of my sources and the preamp in the main system. They are however not neutral, and so must be used with caution. I tried one of these cables before a month or so ago and it didn’t work well then. Now, again, it is clear that the Devialet is not happy using a cable so relaxed as the Pro ACII. Its “smooth-making” effect is way too large on the Devialet, bass transients, attach and dynamics suffering badly. The only good thing in this combination is that the midrange gains a silky-smooth luxuriousness that is quite appealing on slow music but not so much with hip hop, dance or R&B. Second alternative tried was the Fusion Audio Enchanter. This is a costly cable but using it on the Devialet once more demonstrates that it is something special. Its balance is very neutral yet it manages to make small details clearer and giving them more space to work in. Importantly, the Enchanter removed a layer of grunge that was present when using the standard powercable, and the midrange once again has all the lyrical qualities as I remember them from listening to the system during summer time. And the cable does this without becoming slow, thick, or undynamic. Bass is still tight, articulate and fast, but not quite as powerful as with the standard cable. Both 120 and 200 are superb products. The ADH concept really delivers, and then some. On quite a few aspects these amps perform even better than my current reference amplifiers and that really is saying a lot. For me, these Devialets mark the moment where class D really started to deliver, thanks to the clever combination with class A, and the other sophisticated technologies that make the Devialets work. 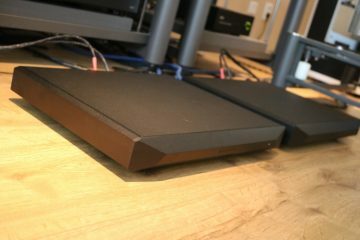 I haven’t touched on the built in phono stages and also want to see what happens if the 200’s power is turned down to 120 levels, but will likely still do so at a later stage and I will then update the review. As a tech lover, I am really falling for the Devialet’s appearance and high-tech configurability, but as a reviewer I am limiting my options with this amp, as it precludes the use of an external preamp, poweramp and DAC. Well, that’s not entirely true of course as all these devices can actually be connected, but I’ve tried an external DAC and the Devialet simply sounds best when used integrally. 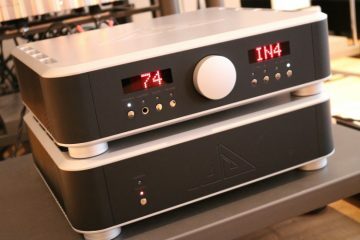 Even the brilliant Jeff Rowland Aeris DAC did not improve the sound, which makes sense because the signal in this case goes through an extra step of converston (DA-AD-DA). This also means that no real meaningful comparisons can be made with analog interlinks and this basically leaves only the powercord and the speaker cables. 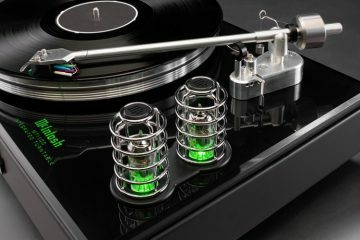 But this really is also one of the strengths of the concept, and the thing that may scare many an audiophile tweaker: after having purchased a Devialet, you’re basically done! No more cable swapping and component matching… The Horror! Regular readers may know that the crossovers that came with this particular pair of Duettas weren’t original. Among others, components had been removed to switch the MRTW ribbon into high output mode, which made for an overly forward higher midrange and treble. 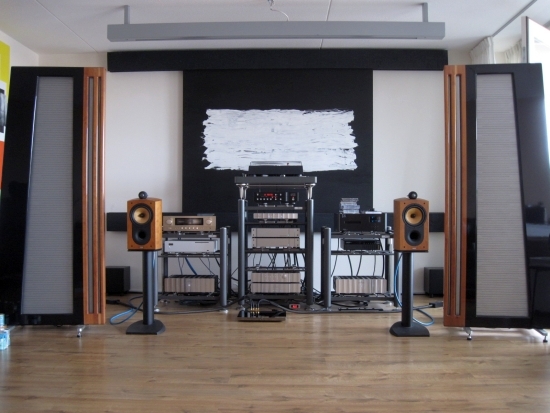 For this review however, listening took place using a separate set of original Duetta Signature crossovers that I was given by Dutch Apogee restorer Henk van der Hoeven. Two of my friends have noted that the Devialet sounds less spectacular in their systems, and there turns out to be a common factor: their high efficiency speakers. One friend has high efficiency Lumen Whites and the other has very high efficiency Avant Garde horn speakers. 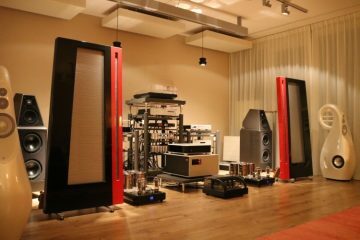 In these situations normal listening level is at around -40dB, whereas for me, with either of my Apogees it is around -15dB. Biiiig difference! 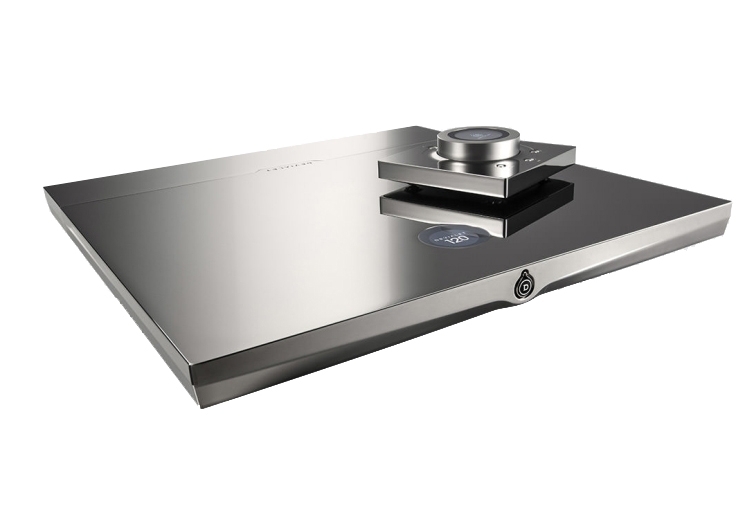 The Devialet’s volume control is in the digital domain, and this is perhaps the main reason why it sounds flatter and less lively at very low levels. 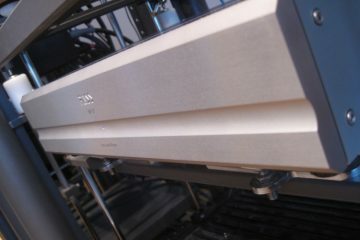 Recently I also used the Devialet 120 with a pair of Monitor Audio PL-100 standmounts. 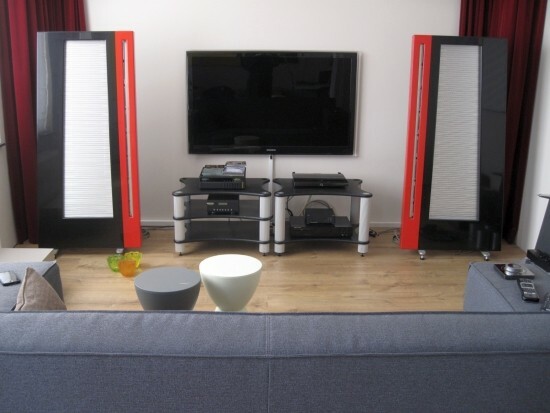 Lovely speakers really, but not a good match with the Devialet. The sound was highly audiophile, but flat and not very colourful or engaging. The PL-100’s are not incredibly efficient so it would appear that in general, the Devialet likes to use its muscles and perhaps due to its huge damping factor sounds just more musical into lower impedance speaker designs. Since a few weeks I own Martin Logan Ethos electrostatic speakers. I know that there are some people who find these speakers, or the combination with Devialet, to produce harsh treble, but this is definitely not the case in my situation. While I used firmware 8.1.3 for the above review, by now my D120 has been running firmware 7.1.3 and this has made a very large and positive difference in terms of smoothness, fluidity and low level resolution. Perhaps the firmware is one reason why it sounds so good, but also note that the Devialet 120 sounds considerably warmer in the midrange than the 200, and positioning of the speakers is just as important. If you find that Logans sound too beamy or harsh, try to reduce the toe-in to the point where the imaging between the speakers begins to blur, then toe them back in precisely enough to get the imaging back. This is the position where the speakers sound least beamy and most relaxed. Also note that even with the more sensitive Logans, I still do not find that the Devialet lacks power or dynamic expression at low volume levels (Devialet volume set between -22dB and -12dB). Asynchronous Wi-Fi streamer Devialet AIR – Bit perfect streaming to the Devialet of any data stored or played by a computer, a smartphone or a tablet PC. Stream any format up to 24 bit/192 kHz. Some words form France, thanks for your useful review on the Devialet 120 and 200. Did you try to pair your 120 with tour B&W 805 ? Hi Greg, the 805’s were already sold before I carried out the Devialet review. However, I did use the 120 with the Monitor Audio PL100’s and this was a magical combination: excellent detail retrieval and treble air, smooth relaxed mids and great bass control without sounding overly tight. The twice as expensive Accuphase E600 that was pulled in for comparison did beat the 120, mainly by having more natural timbre. I also used the 120 with the multi-speakered Audio Physic Calderas and this made the best match I heard with these speakers so far. Knowing the N805’s and D120 individually very well, I imagine that they would combine excellently. What’s more: you might be able to use SAM to enhance the 805’s bass response. That’s great to hear Greg, thanks for the feedback, and enjoy! Hello Sr! Im in a very critical position! I have the oportunity to buy a demo 200, great price and excellent condition! I just bought a Focal Arias 936 last week. In your opinion is this a good match? Hi Leo, not knowing this particular Focal model but having heard several others I have come to know these speakers as bright, lively, upfront performers. The D200, especially with the latest software version, is also a very open and lively sounding component. Together they will likely produce a very energetic sound, but you may also find it a little bit too much of a good thing. In general, I find Devialet to sound best with speakers that are a little difficult to drive, and not so great with very efficient speakers. But it’s a very relative matter and this should also be viewed in perspective of my particular preference for a more relaxed sound in general. I’m going to try to hold my nose and finish the review now that you’ve mentioned you use a ridiculous $500+ USB cable. LMAO….what a joke. What I wouldn’t give to do a quiet switcheroo on you with some kind of cheap Chinese Amazon USB cable. You’d never know the difference. HAHAHAH and then you got into the silly, totally worthless A/C mains power cables!!!! Man I should have known. I can’t take any audio reviewer (or company) seriously when they talk of (or manufacture) super “high end” electrical conductors that are not even in the signal path. Again, I could easily do a switcheroo and you wouldn’t be able to tell the difference between any of those cables (especially on a switching (class D) amplifier!!!! and a Home Depot extension cord). Damn…so disappointed. I can’t take advice from anyone who has been brainwashed by the snake oil salesmen. ‘Twas nice knowin’ ya.